Roseanne Barr blames former co-star Sara Gilbert for the cancellation of the Roseanne revival series. 10 months ago, Barr sent off a racist tweet about former Barack Obama advisor Valerie Jarrett, which she later blamed on a sleeping medication. In the tweet, the comedian said, "Muslim brotherhood and Planet of the Apes had a baby = VJ." The social media message quickly went viral, much to the horror of ABC and Barr's co-stars on the highly successful revival series. Sara Gilbert posted her own tweet in response, calling Barr's message "abhorrent" and declared that it did not "reflect the beliefs of our cast and crew." Within 27 minutes of Sara Gilbert's tweet, the Roseanne revival series was canceled. Now, 10 months later, Roseanne Barr claims that it was Sarah Gilbert who "destroyed" the show in a new interview. Barr even threw in a reference to The Silence of the Lambs in her claims against Gilbert. She had this to say. "She destroyed the show and my life with that tweet. She will never get enough until she consumes my liver with a fine Chianti." The recent interview comes just days after Roseanne Barr made a return to stand-up comedy in Las Vegas with fellow comedian Andrew Dice Clay. 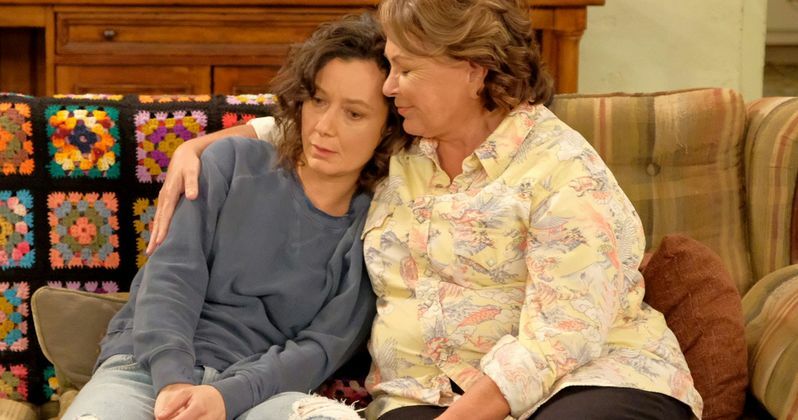 The comedian tore into ABC for cancelling the Roseanne revival series, but did not mention Sara Gilbert during her set. Gilbert's representatives were reached out to, but they did not respond. However, Gilbert did offer a statement to the Washington Post, who conducted the interview. She explains. "While I'm extremely disappointed and heartbroken over the dissolution of the original show, she will always be family, and I will always love Roseanne." Roseanne Barr also admitted to being suicidal after the Roseanne revival series was cancelled. Barr credits Rabbi Shmuley Boteach for saving her life, stating, "He was the only person who stood by me and said they were going to destroy me because I love Trump and Israel." She also has a problem with the way that The Conners carried on without her, claiming that she did not know she was going to be killed off and insinuating that the show's executive producer, Tom Werner, said she'd be a "hero" if she signed off the rights and implied that she may be able to return at a later date. The Conners made the hard decision to kill off Roseanne Barr's lead character, which she is still not happy about. Regardless, the new spin-off was able to pull off some great ratings, which weren't as stellar as the Roseanne revival series, but enough to make ABC, along with the cast and crew very happy. It was just announced today that the show is officially coming back for Season 2. As for Barr, she might have some more stand-up gigs in the future. She has yet to confirm that though. You can read the entire Roseanne Barr interview over at The Washington Post.